Do I Need a Deep Cleaning with My Periodontist in Framingham? Have you noticed that your gums are bleeding when you brush and floss your teeth? You may attribute it to pushing too hard with your toothbrush or floss; however, it is actually a sign of a larger underlying problem—gum disease. This is an infection that develops in the gum tissue due to plaque and tartar accumulations. When left untreated, it can lead to tooth loss and cause general health complications, like heart disease. To treat the infection, your periodontist will likely recommend a deep cleaning, also known as scaling and root planing, but is it really necessary? Yes! To restore your gum health, the accumulations must be removed with this procedure. Do I Need Scaling and Root Planing? Gum disease is a preventable infection if you practice the right oral hygiene habits at home and visit your dentist twice a year for a cleaning and checkup. Although it is preventable, the Centers for Disease Control and Prevention estimates that 50% of adults have a form of the infection. When treated during the earliest stage, known as gingivitis, it is treatable without causing any permanent damage. To stop it in its tracks, a scaling and root planing procedure is needed. This allows your dentist in Framingham to clean below the gum line to remove harmful tartar accumulations, which harbor bacteria. The buildup will cause pockets to develop in the gum tissue. When they reach a depth larger that 4 millimeters deep, it is best to have a deep cleaning. Scaling and root planing is a simple procedure. The scaling process uses a special laser to remove plaque and tartar from below the gum line to clean out the pockets. This provides a less invasive treatment when compared to methods of the past. In addition, the laser sterilizes the area to kill bacteria while promoting the regeneration of healthy gum tissue. The roots of your teeth are then smoothed with the root planing procedure. This helps to reduce future buildup while also allowing your gum tissue to reattach to your teeth. A local anesthetic is used to minimize your discomfort during the procedure. In some cases, the treatment may require multiple visits depending on the severity of your infection. Restore Your Gum Health Today! If you or your dentist detect the early stages of gum disease, do not wait to get the treatment you need. If the infection is not stopped quickly, it can produce lasting consequences for your oral and general health. A deep cleaning will restore your gum health to protect your mouth and body. Framingham Premier Dental embraces state-of-the-art advancements to provide superior dental care to the community. In addition to general dentistry, we offer many areas of specialized care, including the treatment of gum disease. 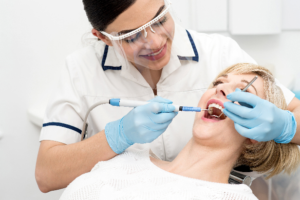 Using laser dentistry, we will treat the infection to rehabilitate your oral health. If you need a deep cleaning, do not wait. Contact our office today to schedule your appointment. Comments Off on Do I Need a Deep Cleaning with My Periodontist in Framingham?